We all know what it’s like to feel tired after a sleepless night because of things like noise, worries or stress. But what if you actually get enough sleep and still feel absolutely beat the next morning? This is normal for many people with obstructive sleep apnea (OSA): They stop breathing for short periods of time (usually without noticing) while sleeping, don’t get enough oxygen as a result, and feel very sleepy during the day. In the long term, this increases their risk of developing other illnesses and can have a huge effect on their quality of life. People who have obstructive sleep apnea usually snore very loudly. They regularly have phases of shallow breathing (hypopnea) and breathing pauses (apnea) that last longer than ten seconds while they are sleeping. Snoring itself is harmless; it is only classified as sleep apnea if you have breathing pauses too. Sleep apnea is caused by the muscles of the upper airways relaxing. 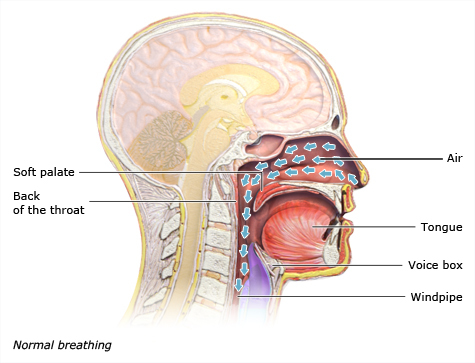 Your throat then becomes narrow or even completely blocked, which leads to loud snoring noises when you breathe in and out. As a result, your body doesn’t get enough oxygen. Your pulse and blood pressure fall too. The part of your brain responsible for breathing sets off an alarm and triggers a wake-up call, causing you to wake up briefly, usually without realizing it. This interrupts your natural sleep pattern, your heart starts beating faster and your blood pressure rises. These interruptions are also called “arousals.” If this keeps happening throughout the night, it may prevent you from entering deep sleep, which is what is needed to get restful sleep. People who have sleep apnea are often very overweight or have unusual features in their mouth and throat area. These unusual features include enlarged tonsils, a small lower jaw, the position of the tongue and a small soft palate. The soft palate is the soft tissue at the back of the roof of your mouth. It is sometimes hard to breathe through your nose too. Sleeping on your back can make snoring and breathing difficulties more likely, but is rarely the only cause. Drinking too much alcohol and taking sleeping pills or sedatives relaxes the throat muscles and can make sleep apnea worse. The likelihood of developing obstructive sleep apnea increases steadily after the age of 45. It is estimated that about 5% of men and 3% of women have obstructive sleep apnea. Severe sleep apnea makes you feel constantly worn out and tired. Not getting enough restful sleep can affect your mood too. If you generally feel less well than people who usually get a good night's sleep, you may also be more likely to become depressed. People who have sleep apnea are at greater risk of developing high blood pressure (hypertension) and other cardiovascular diseases. So they are more likely to have a heart attack, a stroke or an abnormal heart rhythm (arrhythmia). Breathing pauses don’t always cause problems or pose a health risk. If they only occur now and then, are short, and don’t cause tiredness during the day, there’s usually no reason to worry. But it may be a good idea to keep an eye on any breathing difficulties and see a doctor if they cause more long-term problems. If it’s thought you might have obstructive sleep apnea, your doctor will first ask you about your symptoms and lifestyle habits. This is followed by a physical examination. You may be given a portable monitoring device which can be used when you are asleep to record things like your breathing, heart rate, blood oxygen levels, snoring, and body position. If there are any irregularities, you may be advised to have further tests in a sleep laboratory. Sleep laboratories have bedrooms that can be used for one or more nights. Here your sleep is monitored using different recording devices and a video camera. As well as recording your breathing, pulse, blood pressure and blood oxygen levels, they also record your brainwaves, and your eye and leg movements during sleep. Using the recorded data, the different sleep phases can be analyzed to see how long and how well you slept, and whether you spent enough time in deep sleep and dreaming. In people with sleep apnea, the machines can record how often breathing pauses occur, how long they last, during which phases of sleep they occur, and the patient's sleeping position at the time. It is also possible to see how they affect the cardiovascular system and blood oxygen levels. If you’re very overweight, losing weight can help improve sleep apnea. There are also many treatment options that aim to relieve sleep apnea. These include machines that support breathing during the night, surgery, repositioning aids, and special aids such as mouth guards. Some of these treatments have been scientifically proven to help people with sleep apnea. Medication is currently not used for the treatment of sleep apnea. There is no scientific evidence that the previously available medications work. The most effective treatment for severe sleep apnea is called CPAP therapy. CPAP stands for “continuous positive airway pressure.” In this treatment approach, air is taken from the immediate surroundings and blown into your airways at night using low pressure. While you sleep, you wear a breathing mask that is connected to a machine called a respirator. The pressure keeps the upper airways open. People who use this machine have fewer breathing pauses, or even none at all. This can noticeably improve the symptoms such as tiredness during the day. Common side effects include a dry throat and an irritated, sometimes blocked nose. Obstructive sleep apnea can greatly affect quality of life. Sleeping poorly can make you feel tired and “beat” during the day. Some people then fall asleep involuntarily for a very short time during the day – a phenomenon known as “microsleep.” This mostly happens when sitting or during quiet and more passive situations, for example at a concert, or while reading or watching television. It can become dangerous if this happens when you’re driving. Getting too little sleep can also cause problems with concentration or memory. Sleep apnea can affect your relationship if loud snoring disturbs your partner’s sleep, making them feel tired and irritable during the day too. The breathing pauses can be frightening for partners as well. CPAP therapy is the most effective way to relieve obstructive sleep apnea, but it’s difficult to get used to. Not everyone wants to wear a breathing mask every night. Patient education programs can help you get to grips with CPAP therapy. Joining a support group and talking with other people who have sleep apnea can help too. There are now support groups for people with sleep apnea in many German cities. The most important thing is to be patient and get the support you need if you have any problems. If you manage to make CPAP therapy a part of your daily routine, it can really improve your quality of life. Balk EM, Moorthy D, Obadan NO, Patel K, Ip S, Chung M et al. Diagnosis and Treatment of Obstructive Sleep Apnea in Adults. July 2011. (AHRQ Comparative Effectiveness Reviews; Volume 32). Deutsche Gesellschaft für Hals-Nasen-Ohren-Heilkunde, Kopf- und Hals-Chirurgie, Arbeitsgemeinschaft (ArGe) Schlafmedizin. HNO-spezifische Therapie der obstruktiven Schlafapnoe bei Erwachsenen (S2e-Leitlinie). AWMF-Registernr. : 017-069. September 2015. Deutsche Gesellschaft für Schlafforschung und Schlafmedizin (DGSM). S3 Leitlinie: Nicht erholsamer Schlaf/Schlafstörung. Chapter „Schlafbezogene Atmungsstörungen bei Erwachsenen“. AWMF-Registernr. : 063-001. August 2017.